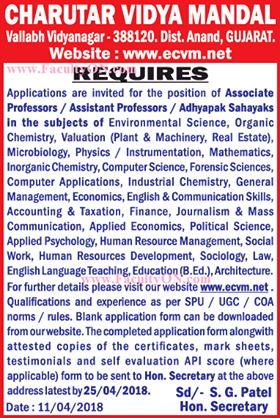 Charutar Vidya Mandal, Anand has advertised in THE TIMES OF INDIA Newspaper for the recruitment of Associate Professor/Assistant Professor/Adhyapak Sahayaks job vacancies. Interested and eligible job aspirants are requested to apply with in 25th April 2018. Check out further more details below. About College: The first fifty years of CVM coincided more or less with the second half of the twentieth century. Judged by any yardstick, these first fifty years of CVM have been immensely successful. The vision, dedication and commitment of the founders of CVM and its subsequent leaders can be seen clearly today in the results of their tireless efforts. Vallabh Vidyanagar is today an impressive and thriving educational campus in the heart of Charutar, which is itself heartland of Gujarat. How to Apply: The completed application form alongwith attested copies of the certificates, mark sheets, testimonials and self evaluation API score (where applicable) form to be sent to Hon. Secretary at the below address latest by 25/04/2018.